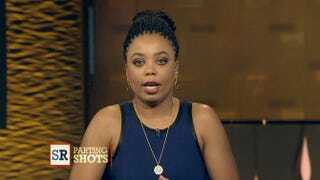 Jemele Hill, an ESPN columnist and co-host of ESPN2’s Numbers Never Lie, said that while Time magazine uses its Person of the Year award to recognize impact, she wouldn’t use “Sports Person of the Year” to recognize high performers such as Serena Williams or Peyton Manning. Instead, she would nominate the n-word for 2013’s most impactful performer, Hill said during a recent appearance on ESPN’s The Sports Reporters: Parting Shot. Philadelphia Eagles receiver Riley Cooper was captured on video yelling it at a concert, and Miami Dolphins lineman Richie Incognito was caught on camera using it “affectionately with black teammates,” she said. Further, Hill said that after Washington Redskins tackle Trent Williams reportedly shouted the word at an umpire, the Fritz Pollard Alliance requested that the NFL fine players for using the word on and off the field.